Barris, Ted. "Robert Kerr". The Canadian Encyclopedia, 04 March 2015, Historica Canada. https://www.thecanadianencyclopedia.ca/en/article/robert-kerr. Accessed 23 April 2019. Track athlete Robert Kerr. 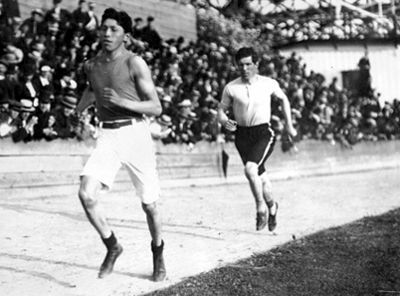 Financial difficulty prevented him from attending the Olympics in 1904, but 4 years later at the 1908 London Olympics he won the 220-yard gold and 100-yard bronze medals. He retired shortly after (courtesy Canada's Sports Hall of Fame, www.sportshall.ca). 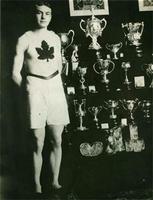 Robert Kerr, track and field athlete, coach (b at Enniskillen, Ire 1882; d at Hamilton, Ont 12 May 1963). Despite the &QUOT;marathon craze&QUOT; of the time, Robert Kerr took advantage of the speed required for his occupation as a Hamilton fireman and won the 100-, 440- and 880-yard races at the 1902 Coronation Games. He could not afford to attend the unofficial 1906 Athens Olympics, but at the 1908 London Olympics he won the 220-yard gold and 100-yard bronze. 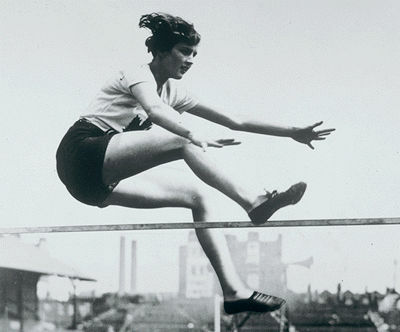 Though he set the 50-yard record and was selected to the 1912 Stockholm Olympics team, Kerr chose retirement. Robert Kerr was captain of the 1928 Olympics team and manager of the 1932 team. Robert KerrA profile of runner Robert Kerr. From Library and Archives Canada.